Tribute albums play a notable part in the enthusiast gaming scene as talented musicians get together to celebrate their favourite games. Often not-for-profit ventures, they help breath new life into classics while tapping into lovely, fuzzy nostalgia. 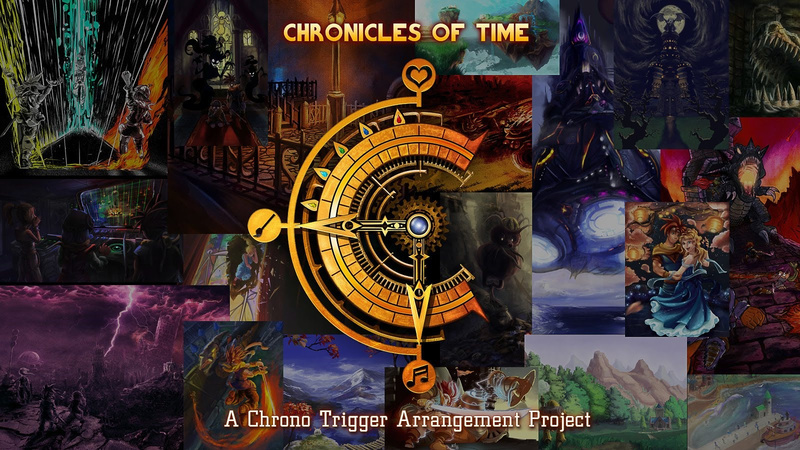 Chronicles of Time seems to tick all of those boxes - it's a 75-track (5 disc) album that remixes and pays tribute to Chrono Trigger. In a cool touch each 'disc' represents a different time era from the game. In the US it costs $20 from iTunes and Loudr, though you can pay more on the latter if you want to do so - that's not the worst idea if you're a fan, either, as proceeds from the album go to Doctors Without Borders. This seems like a hugely impressive fan project, with various skilled musicians, arrangers and bands coming together. You can see a trailer for the album below - let us know if you're tempted to pick it up. A timeless tribute for the ages! I am looking forward to hear it. I should probably play this game, shouldn't I? @Jolt DEFINATELY. It's one of the greatest games on the SNES. At least in my opinion. Do those eras also encompass the End of Time? Oh wait, they're selling this album? Wait, even when it was free that never stopped Square Enix from issuing a cease & desist. @TheHeroOfTime333 @Jolt on the snes? No it's one of the greatest games of all time. I wish they were selling an actual physical disc set. That said I'll probably still buy it. @Yorumi I'd definately have to agree with you on the greatest game of all time thing. I'd buy a physical disc too, without hesitation. Buying this! CT is the greatest game of all time. No challenge. Not likely one will appear, but I'd be far more interested in a physical release. Are there at least FLACs available? @Dr_Corndog When you purchase from Loudr.fm, FLAC is one of the options you can choose to download the album in. @invictus4000 Sorry about that! There's a delay in processing. We'll put a link up on the webpage once it's available via Google Play (and Spotify, and a few other places that Loudr distributes to). @RupeeClock The reason the album is on sale is because it's fully licenced. We're safe from SE's firestorm! @streifig Cool! So it's actually authorised? Square Enix has actually been licensing fan music for years now. To name an example, I'd point out the YouTube user katethegreat19 (Erutan) who produced her own covers for Final Fantasy and Chrono series music for a while, gradually hitting millions of views. Soon after SE licensed her tracks. They even used one of her covers for the new FFIX for mobile trailer. Oh, and I think it's great when companies support talent in this way. Everyone benefits in this kind of situation. On the album, it's great. I've played all of the main FF games, but still haven't found time for Chrono Trigger somehow. I don't think the graphics really appeal to me at all.. not that it's a bad game. This music these guys have done is encouraging me to find a DS copy, however..
Oh boy! I can't wait for this to be Copyright Claimed! @Joestar- The album is properly and legally licensed from its official sources. That won't be happening. @HSFlik Oh, I must've assumed that it was fan project like the Pokémon one, oops. Good for these people, banding together for such a project. However, most of what I heard didn't appeal to me. I'll stick to the original tracks and the new Arrangement Album. That one did give me an English vocal to Radical Dreamers and a vocal variation of Corridors of Time. Never even cared for Corridors of Time until I heard that vocal track. @Jolt yeah ds is currently considered the best version of the game. The one warning I'd give is it adds a new dungeon to the prehistric times that you can just stumble into and not realize it's a side quest. It tends to break the flow of the story and make you way to powerful. If you can find a way to avoid that on a first playthrough it would be good(sorry I forgot exactly where it is as it's been years since I played CT DS). @HSFlik Sweet. I've never used Lourdr.fm, so I didn't know.